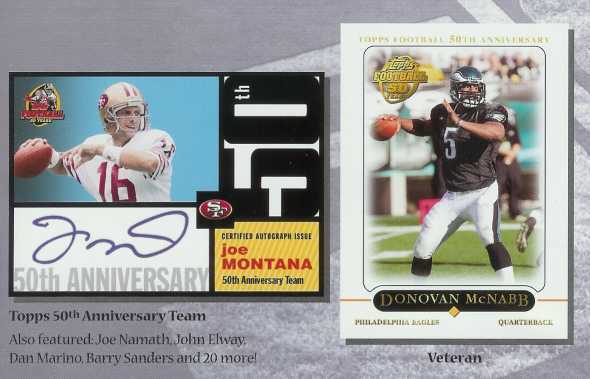 On the heels of announcing plans for the Topps Football 50th Anniversary Celebration, Topps gives collectors a closer look at 2005 Topps Football - the product. This exciting release, which pays homage to Topps legendary football history and the gridiron stars of yesterday and today, is one of the largest Topps Football offerings to date. 49 Throwbacks (1:6) - Active superstars on every Topps Football design since 1956. 25 50th Anniversary Team Autographs - Barry Sanders, Dan Marino and more. *Stay tuned for more announcements regarding the 50th Anniversary Team. 38 Topps Autographs - Rookies, prospects and veterans. 5 Quad Rookie Premiere Autographs - For the first time, 4 rookies will sign the same photo shoot card. *Stay tuned for more details regarding the Rookie Premiere Autographs, one of the most sought after autograph inserts in the hobby. 2005 Topps Football hits store shelves July 27th and carries a $1.59 SRP for each 10-card pack. Stay tuned for more exciting details regarding the Topps Football 50th Anniversary Celebration!